As I prepared this recipe to share with you today, I thought what can I write about that connects to this recipe? I’ve written about family, traditions, being gluten free, indulging every now and then, and more! What else can I write about? And what in the world would connect with trifle? And then I started thinking about what trifle is made of: cake, fruit, creamy layers, and anything else you would like to throw in. Each ingredient is delicious by itself. 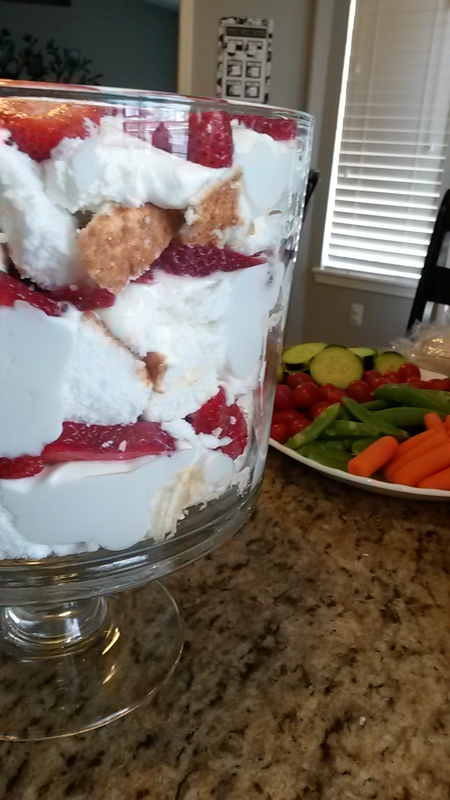 This recipe uses angel food cake and berries. I love both of those by themselves, but when you add everything together it becomes amazing! As I though more about it, I recognized how much like life this is. By myself, I do okay. I work at a library, I attend church, I love to cook and craft. But by myself I can only do so much. With my husband, I can accomplish so much more. With my co-workers at the library, we can help a lot more people than I could by myself; oddly enough I cannot read every book published. I have people that I interact with at church that we share teaching responsibilities, or whatever else needs to be done. When I join forces with those around me, more can be accomplished than I ever could do by myself. And it’s not even a matter of 1 and 1 equals 2. When 2 of us are together, we get amazing amounts done. When there are more, it increases exponentially! The more people we get involved in a project the more amazing it becomes! Recently, I have been attending a lot of family reunions. I love my family, including my extended family. These have been a great example of people banding together to make great things happen. We celebrated my grandma’s 90th birthday this year! When we were first planning this, my aunt who was in charge was wondering where to begin. By talking with me and others, we got ideas of what we wanted to do, who to contact to get it done, and how to involve as many people as possible. But by myself, I could not have done it. It took all of us. Sometimes, I think we have an attitude that ‘I must do this on my own’ for many different types of things. While sometimes this is true, many times it just isn’t possible. I have seen so many examples of how helping others and receiving help from others has enriched many lives. I could not have had the courage to leave a job for the home of something better without encouragement from my husband. I would not have gone to graduate school without having a mentor that coached me about my career. On the flip side, I hope to influence others and enrich their lives. Just as many lives together are better than a lone person trying to make it by themselves, food combinations often end up more delicious than single ingredients. Cheese and tortilla chips are good, but nachos are scrumptious. Lettuce, cucumber and tomatoes are alright individually, but a tossed salad is more inviting. Cake and berries are yummy, but trifle is delectable. What combinations do you love? 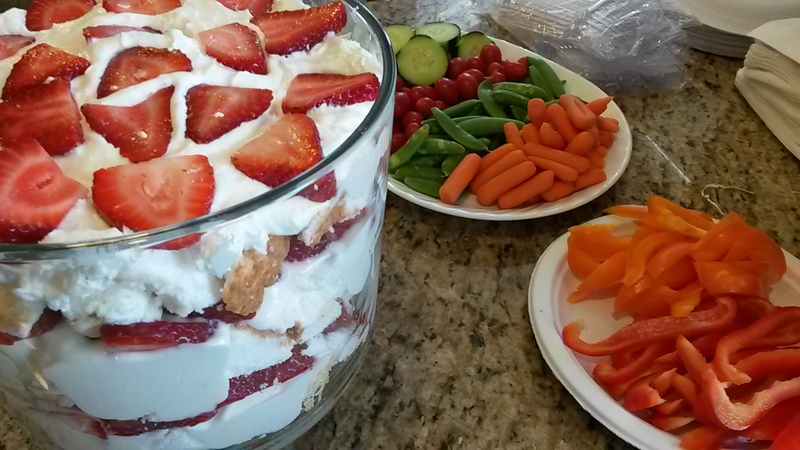 Enjoy this Strawberries and Cream Trifle! I’ve also included my gluten-free angel food cake recipe for you all to enjoy! Luscious and fruity, fantastic dessert to share with everyone! This makes a lot, so make sure people come hungry! Beat cream cheese until fluffy. Add powdered sugar and beat until incorporated. Add vanilla, almond extract, and about 2/3 of the Cool Whip. Beat together until fluffy and smooth. Set aside. Make pudding. Add remaining Cool Whip and mix until smooth. Set aside until set. Slice strawberries and add sugar. Mix together until sugar is dissolved. In large bowl (you may use a special trifle dish if you have one. 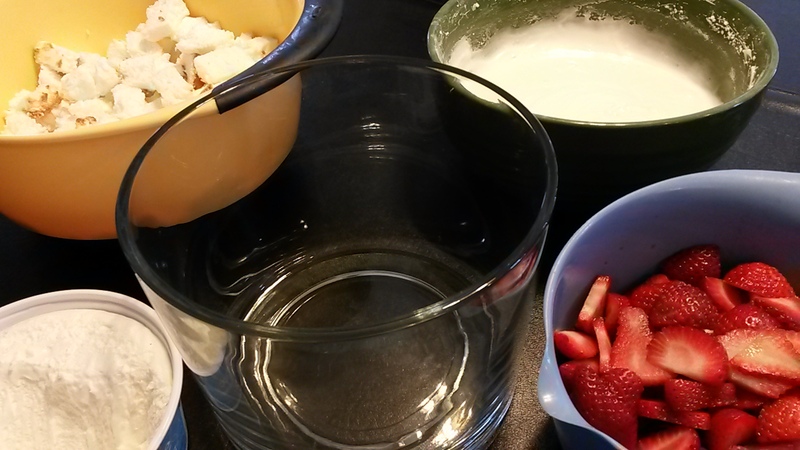 I just used a large mixing bowl), place about ¼ of the torn angel food cake. Put some of the pudding mixture on top, then continue layering strawberries, cream cheese mixture, cake and blue berries until everything is used up. I like to end with the cream cheese mixture and blue berries on the very top to have a nice presentation. Chill 2-3 hours, or until serving. Keeps up to one day, but not much longer than that before it starts dissolving… Best to make the day of serving.